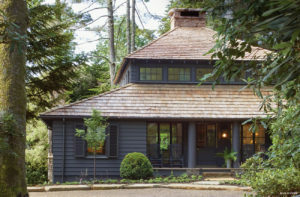 A historic cottage in Highlands, North Carolina, offers a Birmingham family the solitude of a mountain retreat right in the middle of town. The design duo resurrected the home by making small but powerful changes to the floor plan, reusing original materials when possible and brightening up the shadowy interiors. 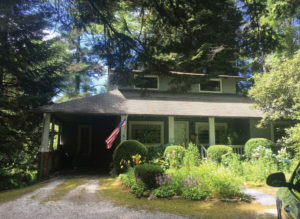 The first floor’s organization, consisting of a soaring two-story main room with a massive stone fireplace, a kitchen, a family room, and a sunroom, as well as two bedrooms and a hall bath remained much the same. 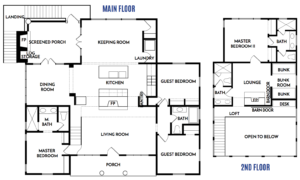 A new master suite was created from the former carport. Upstairs, a long, narrow room became a bedroom with an ensuite bath. 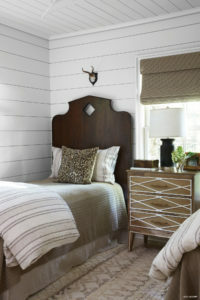 In addition, the designers made more space for overnight guests by carving out a bunk room. The second-floor den, anchored by the central fireplace, and the original bathroom remained. 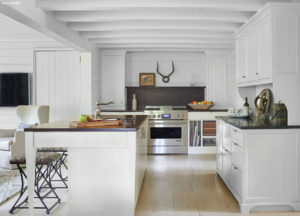 Custom cabinets and soapstone countertops outfit the kitchen, while a hutch offers additional storage. Just past the island, the family room stretches to the back of the house. 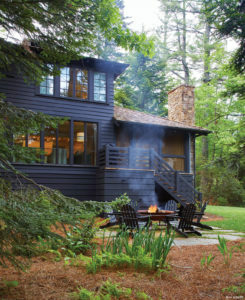 The pine floors and dark-stained paneling that first spoke to Jan were preserved and, in areas that didn’t have them, mimicked. “We reused the old stairs and had to patch and match a lot of the downstairs flooring,” Jeremy says. The original fireplace—crafted with stacked local stones—was repaired and rebuilt where needed. “We tried to keep the house as authentic as possible,” says the architect. For even more authenticity, the design team returned the windows to their original, larger size so that light now pours into the once-gloomy cottage. “We needed as much light as we could get,” Jeremy says. With that in mind, he specified clerestory windows to wrap the top of the main room and also created a front-door wall of almost solid glass. Additional walls of windows and French doors in the sunroom and family room allow light to brighten every space, even the windowless interior kitchen. To enhance the now-luminous interiors, Jan swathed every wall and ceiling in a soft white hue (Sherwin-Williams Natural Choice, SW7011) that bounces and magnifies the natural light. 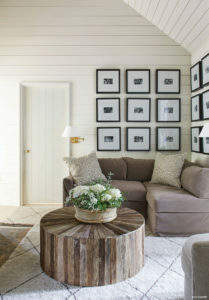 “I wanted to bring the exterior inside with a soothing, natural feel,” she says of the subdued color scheme. 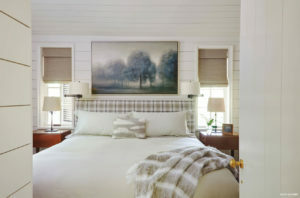 And to complete the charm and comfort of the cottage, she added thoughtful furnishings focused on restful relaxation—the perfect finishing touch. A custom sofa, a Gabby coffee table, and a wool rug (cut to fit around the fireplace hearth) complete the small upstairs den. The frames showcase family photos. 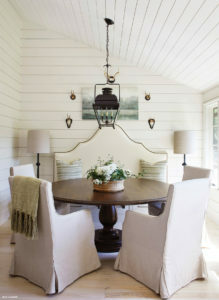 Just off the kitchen, a round table surrounded by slipcovered seating and a built-in banquette occupies the breakfast room—the original sunroom. 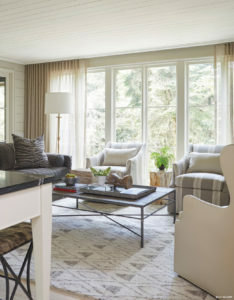 Windows march across the exterior wall, and French doors connect the airy space to the new screened porch. 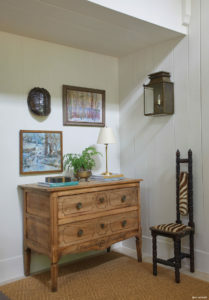 “There are not many antiques in the house, but I found this chest at an antique auction,” says Jan. “The little chair was a last-minute flea market find.” Antique framed art pieces and a tortoise shell hang above the chest. In one of the original main-level bedrooms, Jan dressed a pair of twin beds in natural linen hues. Animal-print pillows stand out against the neutral bedding. “Highlands is an amazing little city,” says designer Jan Ware. “It is a walkable town with a resort and spa, award-winning restaurants, fun shops, and lots to do outdoors,” she says. STAY Old Edwards Inn is a resort with a beautiful bar, two pools, and a spa. Situated in the heart of downtown, the inn includes luxury guest rooms, suites, cottages, and vacation homes. PLAY Get some fresh air on the Whiteside Mountain National Recreation Trail, a 2-mile loop easy enough for the whole family. Venture into Nantahala National Forest for hiking, fly-fishing, camping, white water rafting and more. Or tee off on the spectacular 18-hole golf course at Old Edwards Club.